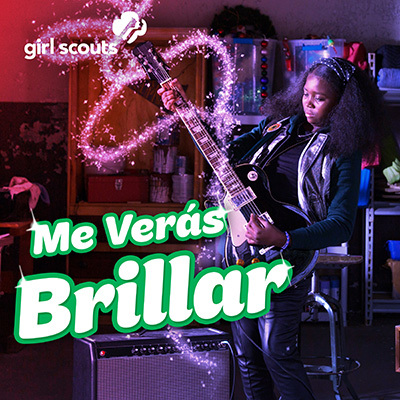 NEW YORK, NY — Girl Scouts of the USA (GSUSA) today released “Me Verás Brillar,” a Spanish version of its “Watch Me Shine” anthem, which the organization released last year. The new song is distributed in conjunction with National Hispanic Heritage Month and emphasizes the importance of girls taking the lead in their communities. For more than 100 years, Girl Scouts has given girls the tools to find their inner leader and empower themselves, and the new anthem is one of the many ways a girl can see herself represented as an unstoppable, inspiring G.I.R.L. (Go-getter, Innovator, Risk-taker, Leader)™. Breakthrough Music was founded by leaders in music and communications innovation with the goal of developing new music distribution models that are built on trust and fair business practice. The company leverages deep relationships in the music and technology worlds to bring innovative ecosystems together for unique, custom, strategic solutions for companies looking to enhance their customer experience. To learn more about Breakthrough Music, contact us at info@breakthroughmusicgroup.com.